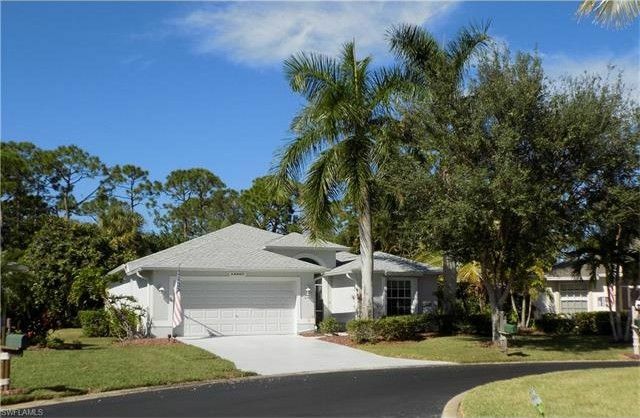 You will enjoy peace and quiet in this pristine clean home 3 bed / 2 bath / 2 car garage in the beautifully landscaped gated community of Heritage Cove. This popular Dover model is light and bright, fully furnished, turnkey, located at the end of a quiet cul de sac. It features new AC system, all new up sized duct work, new roof / gutters, new washer / dryer, new hot water heater, new carpeting, hurricane shutters, crown molding, back lighting and beautiful landscaping. Heritage Cove is the area's premier 55+ community, with a full time onsite property manager Mon-Fri, an abundance of social activities...tennis, bocce, shuffleboard, bingo, large community pool / spa, large modern exercise room, community room for banquets, library, computer room, pitch-ins, shows, bingo, cards, you name it. Add the walking paths, 55 acres of lakes, plenty of area for biking and great neighbors...we'll keep you busy! Heritage Cove is located close to Fort Myers Beach, Sanibel/Captiva, RSW Airport, an abundance of shops, restaurants and the Downtown Fort Myers River District. HOA fees are low and include Internet and TV. This is a new listing! Call, text, or email for your private showing! today!